In a setting as naturally picturesque as the remote Alaskan forest, it’s only fitting that the structures built within it be equally beautiful. 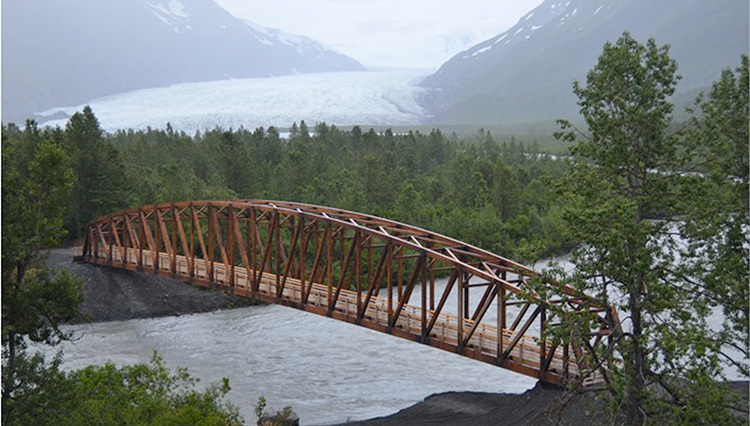 With its graceful glulam beams and elegant symmetry, the Whistle Stop pedestrian bridge on the Kenai Peninsula fits well with the wild river it crosses and the scenic glacier it leads to. Designed and fabricated by Western Wood Structures, the 280-foot camelback truss bridge is the longest clear-span glulam timber truss bridge in North America. Funded by the American Recovery and Reinvestment Act, the bridge is the latest addition to the U.S. Forest Service’s Whistle Stop Railroad project, a unique summertime travel experience created in partnership with the Alaska Railroad. Taking visitors into the heart of the Chugach National Forest, the Whistle Stop line will include five station stops from which passengers can exit the train to see the sights or go camping. At the Spencer Glacier stop, the Placer River Trail Bridge offers safe passage across the Placer River to access planned future developments, including primitive cabins and the 10-mile trail to the Grandview Whistle Stop. Project planners within the Forest Service wanted the bridge and train stations to emulate the railroad work camp culture of the early 20th century, when the region was dotted with unpainted wood cabins, white canvas tents, and native lodgepole pines. As such, the proposal’s design narrative identified wood as the preferred predominant aesthetic material. Though the project did not require wood for the structural components, Western Wood Structures’ submission, a camelback timber truss design complementing the style of the existing steel railroad bridge a quarter mile down the river, won out for its natural beauty, cost effectiveness, and durability in the harsh Alaskan wilderness. In addition to a 90-pound-per-square-foot (psf) pedestrian load, the bridge will face numerous other stresses because of its location — most notably wind gusts up to 120 mph, 200-psf ground snow load, flooding potential, and high seismic events. Lateral loads due to wind and seismic events are resisted by both vertical portal frames at each truss panel point and horizontal chevron bracing in the planes of the top and bottom chords. The bridge was analyzed as a three-dimensional structure using SAP2000, and the design conforms to the current AASHTO LRFD Bridge Design Specifications. Preservative-treated Douglas fir glulam was used for the truss members, floor beams, purlins, and all bracing members. The Forest Service in Alaska promotes the commercial use of Alaskan Yellow Cedar (AYC) as a structural material. AYC was chosen for the deck, posts, and rails since it is naturally decay-resistant and does not require preservative treatment. This allowed for no preservative use in the pedestrian contact areas. The 15-foot-wide structure features a 6-foot walkway, ample enough to accommodate administrative vehicles. The 280-foot trusses are 15 feet high at the ends and more than 27 feet high at midspan. The structure rests on steel H-piles driven about 40 feet into the ground at the east and west ends. ASTM A588 weathering steel, which blends nicely with the color of the treated wood, was used for all truss member connections. Building a bridge from opposite sides of a rushing and unpredictable river in a harsh, remote location brings its own special set of difficulties. With incredibly short construction windows of three to four months per year, bridge erection was spread over three summers, with completion in late July 2013. The prefabricated glulam timber sections traveled an atypical path from their origins in Tualatin, Ore. The timbers and other bridge steel sections were trucked to Seattle and loaded on a barge bound for Whittier, Alaska. The materials then traveled by rail to Portage, Alaska, and next on the Whistle Stop rail line to the Spencer Glacier station. All additional materials, equipment, and crew also had to arrive by rail. A rail spur on the east side of the river provided relatively easy access for unloading the contractor’s temporary camp trailers, equipment, and half of the bridge. But without a rail spur on the west side of the river, the rail cars had to be unloaded while the train remained on its track, placing the team and the schedule at the mercy of the Alaskan Railroad. With no road to the site on the west side, the crew of contractor Patrick Engineering had to build a 1,000-foot-long road from the tracks to the construction site to transport supplies. During construction, contractors crossed the river in a skiff — assuming the river wasn’t too high or too low at the time. The location also required the crew to camp onsite for the duration of the erection activities. These challenges are likely not surprising to anyone who has built in remote backcountry, but the combination of the rugged elements and a first-of-its-kind design, accomplished in spite of the difficulties, further adds to the mystique and appeal of the Placer River Trail Bridge as a destination. The bridge provides much-needed infrastructure to the burgeoning Alaska tourist industry destination in a way that greatly enhances the experience. The rustic, robust wood structure is a perfect point from which to experience both the region’s historic roots and its unparalleled natural surroundings, while providing a backcountry Alaskan experience for people of all abilities.